So I generally stick to jelly candies like Kushy Punch’s indica gummy, finding fruit better masks the tang than most infused chocolates. Still, I haven’t given up on them. Bhang, the world’s most widely distributed edible company, produces a wide array of infused cocoa candies like this 100mg Ice Chocolate Bar. Their CEO, Scott Van Rixel, is a master chocolatier with more than 25 years of experience making artisan chocolates–an instrumental factor that’s made Bhang an eight-time Cannabis Cup “Best Edible” winner. Does this peppermint milk chocolate bar have a heavy cannabis flavor, or will it restore my faith chocolate edibles? We’ll examine this taste along with other key product factors here in this in-depth review. The packaging is fairly basic yet aesthetically pleasing. The stylistic, glossy cardboard box is thick enough to handle being thrown in my purse, backpack or cannabis drawer (we all have one, like the drawer with old soy sauce, sugar, and hot sauce packets). Inside, the Ice Chocolate bar enjoys an added layer of protection with a black, resealable, child-resistant bag similar to the one housing NUG’s milk chocolate bar. The front’s inviting, bright pink accents help it stand out on dispensary shelves, but it doesn’t scream peppermint. There’s also a cocoa pod on one side and a cannabis leaf on the other, representing Bhang’s mix of both. For all the steps the company takes to make their packaging appealing, Bhang could take a couple more to make it informative. While it meets the basic adult-use labeling requirements, it lacks any real details on the extraction process, strains used and cannabinoid content. The only labeled cannabinoids are on the back of the box: THC (100mg), CBD (<1mg) and CBN (<1mg). Made with peppermint, South American milk chocolate and barely detectable CO2 cannabis oil derived from hybrid strains, this icy chocolate bar is creamy, dense (unlike describing a first date this way, dense is a good sign), and packed with the perfect amount of peppermint. Reminds of Andes Creme De Menthe Thins I enjoyed after meals as a kid. It’s easily broken into 10 pieces with 10mg of THC each with clear demarcations so you always have a single dose. If you need less split it with a knife or hand, though you might get a less-than-exact dose. All pieces are engraved with the Bhang “B” logo along with a marijuana leaf, a helpful touch should you lose the box. As mentioned, the lack of overt cannabis flavor makes this cooling cocoa bar accessible to everyone, even if you usually hate the taste of edibles (not that I know anyone who does; I don’t need that negativity in my life). When this flavor combo converges on my taste buds, my mouth does a happy little dance. It’s like eating a fancy, dense, melt-in-your-mouth chocolate left on a Parisian hotel pillow–only with an icy blast of peppermint and a smooth high. Newbie or have low tolerance? Two pieces are enough to satisfy your state of mind and stomach (cut them into smaller doses if needed). If you’re an edibles veteran like me, prepare for a full stomach as you’ll probably eat the whole dang Bhang bar. I decided to eat most of this bar (90mg) before walking into a movie. About 30 minutes in, I felt a subtle change that didn’t hit as heavy as expected. After about 90 minutes, the hybrid high gave me a boost and a smile. I was clear-headed, felt creative and fully functional for the rest of the afternoon. However, this wasn’t the best choice for a movie since it made me fidgety; I wanted to get up and become active. If you want body-melting couch-lock, you’re better off with KIVA’s 100mg Blackberry Dark Chocolate Bar. Luckily, this cannabis milk chocolate bar is relatively affordable, around $15, especially considering the quality of the South American chocolate. 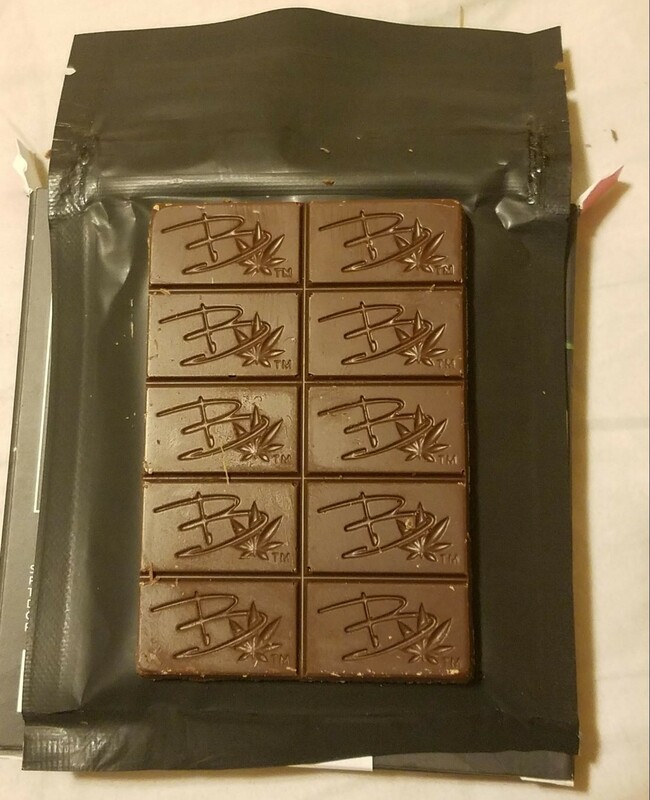 A solid sell since most 100mg chocolate edibles retail for around $20. Housed in a fairly sturdy cardboard box that appears well-protected. Inside the box the peppermint chocolate comes in a nondescript, child-resistant, black zip-bag. 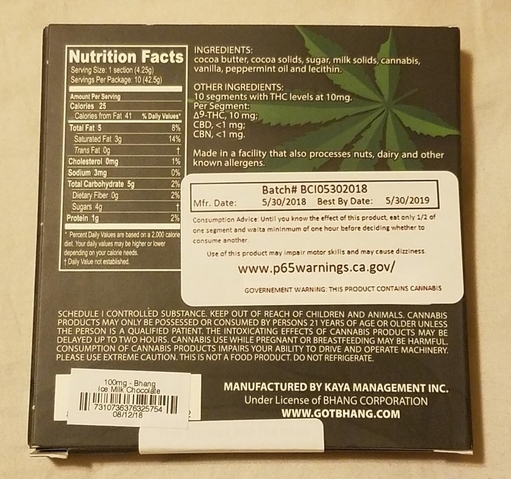 Preferred the edible came sealed or wrapped in another layer like a plastic tray or aluminum wrapping instead of loose in the black zip-bag. Sufficient labeling for adult-use compliance, but not much more. I’d like to know that it passed safety screenings and something about growing and extraction/infusion practices. Easy to break into 10mg servings and cut even further with a knife, though those aren’t always even and could produce an slightly inaccurate dose. Also small enough to eat the whole bar (if you like a high dosage like I do). Box is tiny enough that you can cover any cannabis labeling with your hand. Plain, black zip-bag within the box shouldn’t turn any heads. Close-up you can notice the stamped “B” and cannabis leaf. A wonderful minty chocolate with no cannabis taste whatsoever. Reminds me of Andes “Creme De Menthe Thins” with a more subtle mint flavor. I’d eat this even if it didn’t contain cannabis, it’s delicious. Texture was exactly what it should be for a chocolate bar. Melted smoothly in my mouth for a pleasant mouthfeel. About 30 minutes after consumption, I started to feel a head-change. The effects weren’t as heavy as I expected after ingesting 90 mg of THC. Gave me a productive and creative buzz (not the best for movie watching). Wonderfully versatile, as most chocolate bars are. Break the bar at the indentations and add it to s’mores or place a piece in between a cupcake or cookie. Melt it down into hot cocoa, drizzle on fruit or give a minty-chocolate kick to your favorite dessert recipe. Bhang was one of the first edible brands on the market (that I recall). It’s stayed afloat despite legal woes and remains competitive by maintaining consistent results in both flavor and experience. At around $15, this edible is relatively cheaper than most 100mg THC chocolate bars. A great price for the quality of chocolate and the clear-headed effects. 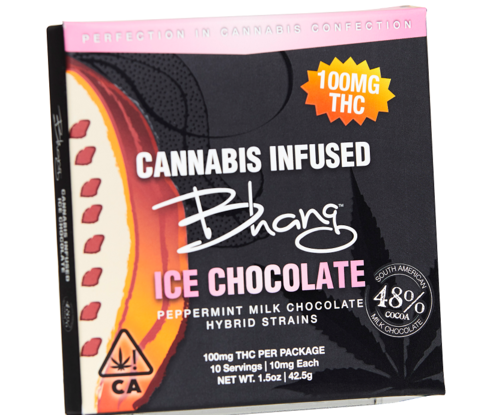 Bhang’s 100mg Ice Chocolate Milk Chocolate is made from sustainable, high-quality ingredients and, to my pleasant surprise, has no cannabis taste. It’s deliciously minty, affordable, and provides an active hybrid high that makes me want to get up and move. Considering it made me rethink chocolate edibles, I’d buy this infused peppermint candy bar again, especially for only about $15. You really do get some Bhang for your buck!